Today’s chapter hits on several biblical examples, both positive and negative, of man-fearing and God-fearing. Citing figures such as King Saul, the Pharisees, Peter, and Paul, the author explores what peer pressure and the fear of man looks like in the Bible. Fear of man also controlled some of the Pharisees. Many Pharisees unabashedly condemned Jesus and his teachings; however, some Pharisees could not deny Jesus’ miraculous works and powerful message. They did not confess their beliefs, though, because “they loved praise from men more than praise from God” (John 12:42-43). Paul was not a people-pleaser. He was a people-lover, and because of that he did not change his message according to what others might think. Only people-lovers are able to confront. Only people-lovers are not controlled by other people. Paul even indicated to the Galatians that if he were still trying to please men, he would not be a servant of God (Gal. 1:10). Peter seems to have grown here, encouraging his readers to not fear man but to fear God. So, in our lives, we can draw comparisons to these men. I will say that confrontation terrifies me, and in that way I shy away from Paul’s good example. Over the past few years, however, the Lord has granted me opportunities to lovingly confront and see good fruit come of it. I feel I have a long, long way to go. I hope that one day I can lovingly confront someone without near-paralyzing fear, but for now that is an area where I can depend on grace to meet me. 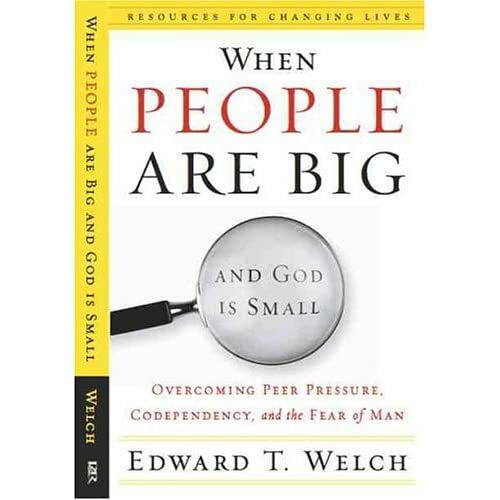 This entry was posted in theology, When People Are Big and God is Small. Bookmark the permalink.